Cocoyam is a tropical starchy tuberous root crop. There are many varieties of cocoyam but the most common are the soft variety used mainly as soup thickeners and the yam-like variety that can be boiled in a short time and eaten with pepper sauce. This is a very traditional soup, native to the eastern part of Nigeria. The only difference between Ora Soup and Bitterleaf Soup is the vegetables used in preparing them, yet they taste so different. The cocoyam is cooked, cut into thin chips and dried in the sun. The resulting flakes are later soaked in water and cooked with vegetables. In this meal, both the corms and the leaves of the cocoyam are used as ingredients. Cocoyam is planted a bit later in the rainy season, in the months of May and June. This is because it requires more moisture to germinate. Harvest for cocoyam begins in late September and ends around January, just before the dry season becomes too hot. 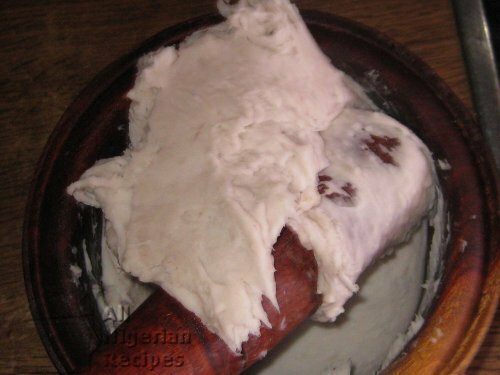 Cocoyam, like yam, can be stored for several months and it will still retain its taste. It is best stored in a cool, dry and well ventilated place. Most times they are stored on raised racks because the bare floor causes them to rot. 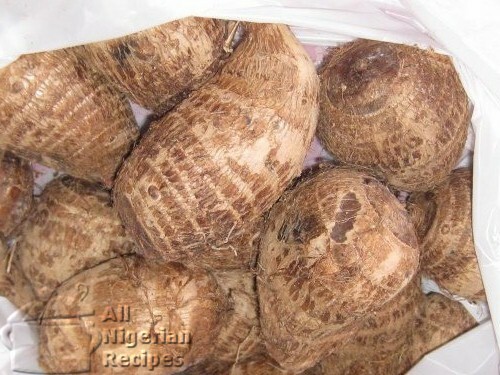 Cocoyam, when in season, is readily available in the open Nigerian markets. It is harder to find them in African food stores outside Nigeria. When buying cocoyam, carry out visual inspection of the corms. Press all parts of the corm to make sure that it is firm all over. Soft parts are the first indication that the cocoyam is going bad. Also avoid the ones with bruises or cracks as much as possible. Most bruises occur during harvest or transportation and may cause the affected parts to go bad. Cocoyam corms are rich in carbohydrates while the leaves are a good source of vitamins A and C and contain more protein than the corms.